What is a Golf Handicap Index? A golfer's handicap index is intended to show a player's potential, not his average score, as is the common belief. The term 'Handicap' in golf is an indictor of a golfer's playing skills in the game. The lower a golfer's handicap, the better the golfer is. A 2 handicapper is better than a 10 handicapper who is better than a 20 handicapper. How does a Golf Handicap Index work? For example, you have a golf handicap of 24: If you played a game on an 18-hole golf course and records a score of 96 strokes on a par 72 golf course, you have "played to your handicap" (96 – 24 = 72). The 96 strokes you have taken is described as your "gross score" and the result of 72 after deduction of your handicap is your "net score". In a handicap competition, it is the net score that counts. In a “scratch” competition, only the gross score is recorded and handicaps are not taken into account. All professional tournaments and top amateur games are scratch competitions. On the other hand, in most (but not all) golf club monthly medal games, inter-club games and society events are handicap competitions. There is a handicapping system computation on the score for each of the individual's golf games relative to the difficulty of the golf course. What is an Official Golf Handicap Index? An official handicap - one that is established through the auspices of a United States Golf Association (USGA) affiliated club - is called a 'handicap index'. To establish a handicap index, a golfer needs a minimum of his five most recent scores, plus the course and slope rating of the courses played. Once a handicap index is established, it is then used to determine a course handicap. A course handicap tells a golfer how many strokes he is allowed to take on a specific golf course; that is, a course handicap of 14 means the golfer will be able to deduct 14 strokes from his score throughout the round. Handicap indexes are used so that golfers of widely different playing abilities can compete fairly against one another. Why do golfers need an Official Handicap Index? 1. To measure the golfer's playing skill of the game. 2 To have a fair and equitable basis when playing against other golfers in a competition. 3. A Handicap Card is sometimes required to play golf on a particular golf course. 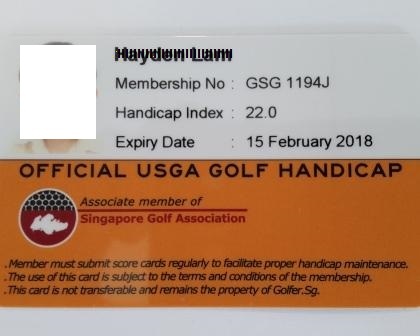 Where can golfers get an Official Handicap in Singapore? An individual will need to join a recognised golf club or an official handicapping scheme body in order to attain a golf official handicap index. In Singapore the Singapore Golf Association (SGA) have appointed associated agents to allow golfers without a golf club membership to take the golf handicap practical and theory test.